Note：You can also use cauliflower,pine apple for this Achar. 2. Prepare a big pot of water mix with 10 ounces of vinegar, bring to boil and scaled the vegetables for about a minute, drain and put aside, repeat the same process with all of the vegetables, one type at a time, DO NOT scald them together. 3. 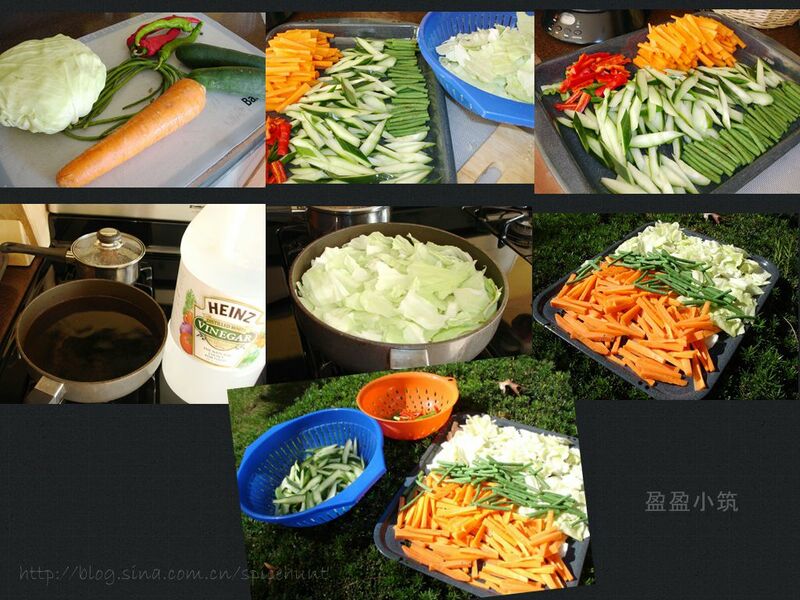 Make sure the vinegar water was all drained before spreading them on flat baking sheets (or chinese style bamboo flat colander) preferably those with holes that allow excess water to drain out during the process of isolation (this is a very important step, as this allows the vegetables to stay crunchy and do not release too much water after being pickled, this step also helps to preserve the pickles better as it reduces water content in vegetables. 4. While putting the vegetables out under the sun ( you want to check the weather forecast before starting the pickling process, a good few hours of sunshine is needed to achieve desired result). 5. 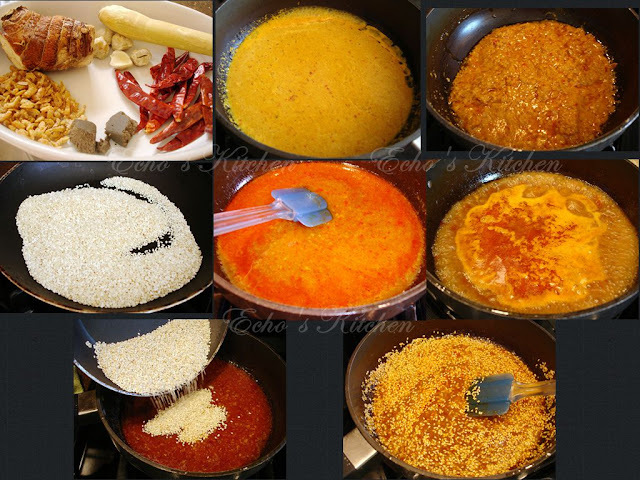 Grind together the dried shrimp,chilies,galangal, lemongrass, and turmeric (which is not in the picture) with some of water to form a paste, cook the grinded paste it in a cookware until thickened, add 6 tablespoons of cooking oil into the pot and continue cooking until fragrance. 6. Meanwhile, roast sesame seeds at medium heat until it is fragrance, let cold. 7. After the paste is ready, pour in 6 ounces of vinegar, 6 tablespoons of brown sugar, 1 teaspoon of salt and bring it to boil again, leave it aside to cool down. Add roasted sesame and crushed roasted peanut and mix well. 8. When the vegetables are looking tired and dehydrated after 4 hours, now is the time to pickle them! 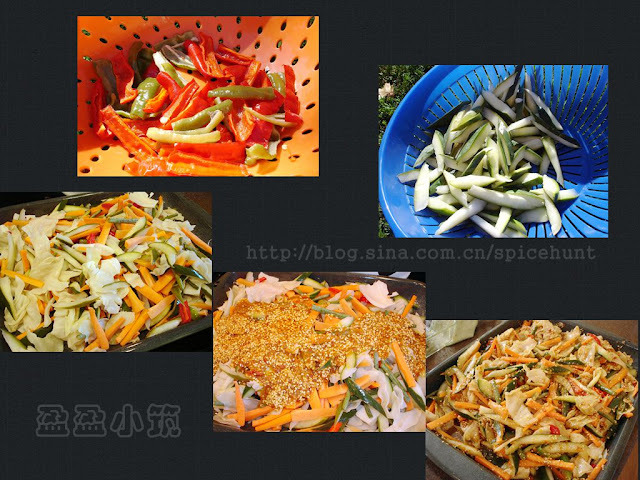 Combined all the vegetables on a large container or mixing bowl, pour in the paste, mix until all the vegetable pieces are coated with the spices. 9. Bottled and refrigerate it for 2 days before serving. IF PINEAPPLE IS ADDED, DOES IT NEED THE SCALDING PROCESS TOO? Hi, no Pineapple need no scalding.